Let's try that again: Dallas is finalizing a deal to land Kristaps Porzingis, league sources tell ESPN. Need to know the status of his ACL but hot damn. Per @TheSteinLine, it's gonna be Porzingis, Hardaway and Courtney Lee to the Mavs; Dennis Smith, DeAndre, Wes Matthews and a pick to the Knicks. The deal being close to be finalized between Dallas and New York is Kristaps Porzingis, Courtney Lee, Tim Hardaway Jr. for Dennis Smith Jr., DeAndre Jordan, Wes Matthews, and a pick, per league sources. The Knicks would also have to add one $1.5M player to make salaries work. What is this "future first round draft compesation" Stein is talking about? We can't trade picks now right? People were questioning Jordan being out with a mysterious illness, then his failed meeting with the Knicks, then the preferred trade...then boom. Plus, Donnie traveled to NY last night. It all came together. Sources: New York and Dallas have agreed in principle on a trade sending package around Kristaps Porzingis for Dennis Smith Jr. Wes Matthews, other contracts, and picks going to New York, and Tim Hardaway Jr., Trey Burke among players going to Dallas. Sides finishing final terms. Side note: How do you guys embed tweets on this forum? I wonder if we see Barnes move as well now? Last edited by AO41; 01-31-2019 at 03:57 PM. Trey Burke is interesting inclusion if he is included. Knicks fans just jumped off a cliff. I think we have to. Not completely on board with this but whatever. Rather trade Barnes than Wes, and we have no rebounding now. Last edited by EricaLubarsky; 01-31-2019 at 04:04 PM. Last edited by EricaLubarsky; 01-31-2019 at 04:08 PM. I hope KP comes back healthy because with Luaks all around game and KPs scoring...we should be sooo good. So this has obviously been in the works for a while. There is like zero chance KP walks into the Knicks office, says "trade me", and an hour later all is done. Somebody theorized on Twitter that New York leaked this to put the blame on Kirstaps before trading him. Makes sense. If KP will return to 100% health this is obviously a steal. Turning Dennis, cap room, and whatever pick into a top 20 player, my goodness! Especially since the Knicks could have drafted Dennis last year lol. No way Knicks take multi-year contracts. They want all the cap space this summer. Let's hope they move Barnes in a separate deal. Gonna go back and watch tonight. Bittersweet day. Mavs seem to love Barnes, but come on, Wes going out is one of the best things about the trade. I don't like moving DSJ, but for Kristaps? Gotta do it. Only way I could be happier is if we also dumped Barnes and Powell. Wait a second. Why is he taking the qualified offer? Wouldn't we want to just lock him down with an extension? Honestly I think moving DJ Im most bittersweet about it. 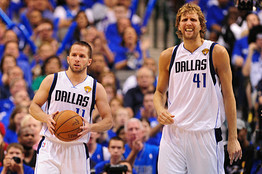 Not mad, because its KP, but I just liked having him in Dallas. With the Barnes/Wes thing is we need more of Wes 3 than Barnes scoring, so rather move on from him first. But like joshi said, maybe theyll move him in a separate deal. OK, so what is NY's play with this? Just getting something before KP bolts this summer as a FA? Not sold KP will recover from the injury? If we haven't talked about an extension, which we may be silly to do yet, then signing the QO is the better option. Good news is if he isn't healthy, then you won't be locked in it. But indeed that is a bit strange. He's an RFA this summer, not a UFA. He will get the QO and return next year. If another team gives him a huge offer, we match and it's basically an extension. We'd be silly to offer him an extension before playing a game. QO locks him up for AT LEAST one more year. IF another team offers him anything, we match and lock him in to a longer deal. Honestly QO is the best. 1) If someone offers him money, we can match and it may actually save us money. 2) If no one offers, we can work on an extension all next year. Last edited by EricaLubarsky; 01-31-2019 at 04:19 PM. Skin said something about him signing the QO and that gives him a cap hold. We can then sign other FA and go over the cap to resign KP. For the Knicks they have 3 lottery picks and cap room this summer. They could possibly sign 3 max players this summer? Hope this means full out tank. So I have two questions. First, how are we trading a first round pick? And second how's our cap situation now? Yeah I'm just going to have faith that this is some cap shenanigans or something. No way we'd trade for Porzingis only to let him go as a UFA. I saw one tweet that said he won't meet the starter criteria this year so his cap hold will go down from 7.5 mil to 4.5 mil. That's potentially another 3 million in cap space to sign other players. I dunno.